A series of drawings from an isometric perspective, in the style of a computer game, are the new body of work in Jon Haddock's exhibition "Screenshots." The subject of each drawing is the image, or images, that created a popular cultural event. 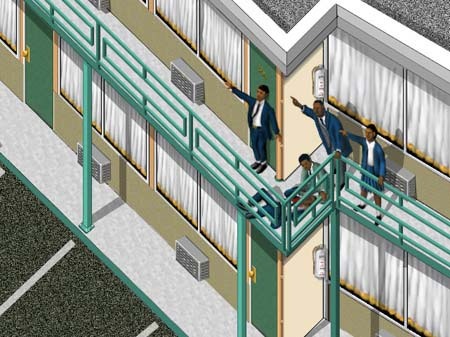 Historical events like the assassination of Martin Luther King Jr. at the Lorraine Motel are used interchangeably with fictionalized events like the death of Fredo scene from "The Godfather: Part II," questioning the role and influence of the image in today's technology-driven society. "Screenshots" is a project by Jon Haddock for the exhibition "No Absolutes." "No Absolutes" includes the work of regional artists Robert Adams (Phoenix), Connie Arismendi (Texas), Colin Cook (Southern California), Kim Cridler (Tempe), Luis Gutierrez (Texas), Jon Haddock (Tempe), Leslie Hill and Helen Paris (Tempe and London), Craig Smith (Phoenix), and Joe Willie Smith (Phoenix). (left: Jon Haddock, The Lorraine Motel, digital c-print, 24 x 31.5 inches, courtesy of the artist. Jon Haddock received his BFA from Arizona State University in 1986 and went on to receive an MFA and MA from the University of Iowa. He has recently exhibited at Roberts and Tilton in Los Angeles, Rena Bransten in San Francisco and Howard House in Seattle.